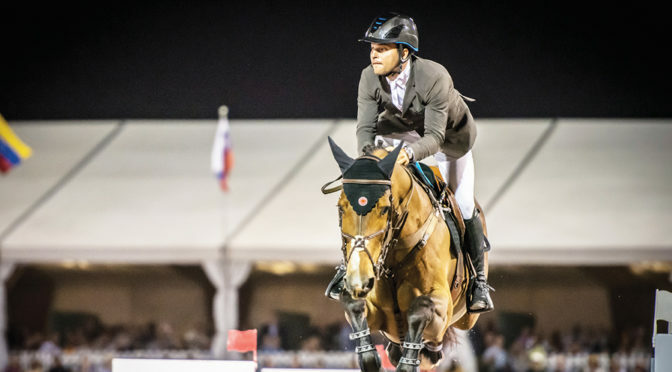 A two-time Olympian for his native Colombia, Daniel Bluman holds dual citizenship with Israel, and he recently switched flags in an effort to qualify an Israeli show jumping team for the Olympics. He rode under the Israeli flag at the 2018 World Equestrian Games in Tryon, N.C. Bluman began riding at three years old. As a young rider, he competed in Colombia, Germany and the United States, training with some of the top equestrians in the world, including Nelson Pessoa. In 2007, he moved to Wellington, where he started his professional career. In 2016, Bluman represented Columbia at the Rio Olympics riding Apardi. It was his second time at the Olympics. He placed 20th individually at the London Olympics in 2012. Bluman had a strong showing at the 2018 Winter Equestrian Festival. He captured the $205,000 NetJets CSI4* Grand Prix aboard his Olympic partner Sancha LS, and he also won the $384,000 Fidelity Investments CSI5* Grand Prix riding Landriano Z. Bluman followed that up with wins last year at Spruce Meadows, Tryon and Toronto. Look for him back in the action this season at WEF.